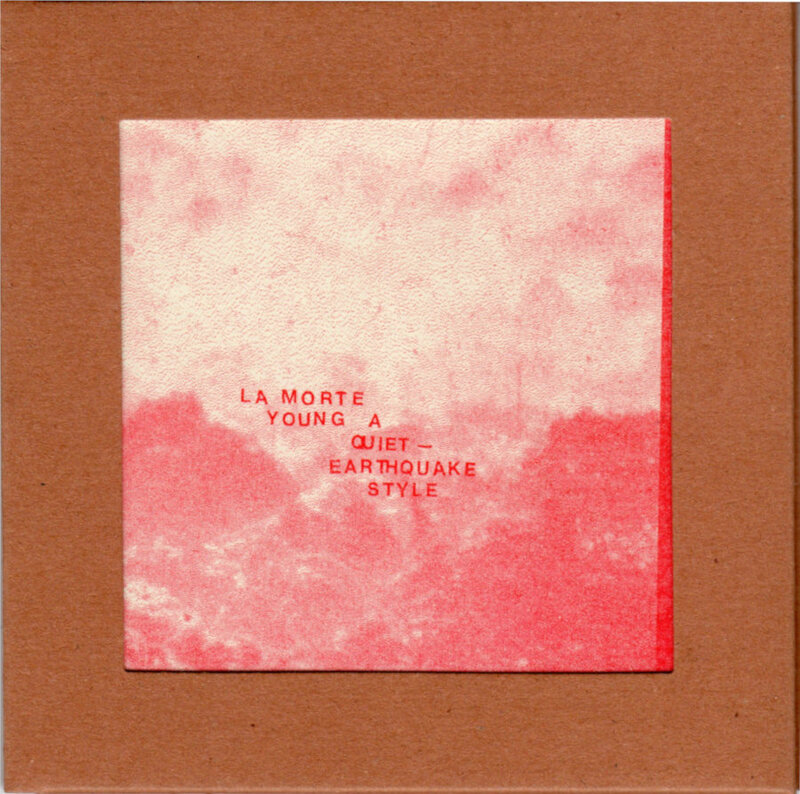 French heavy avant-guitar beasts La Morte Young have invaded our home turf before with their self-titled album for Dysmusie, a hideous monster of tuneless guitar noise released in 2013. A good album, but it didn’t quite deliver the death blow. Now the players – guitarists Pierre Faure and Thierry Monnier, bass player Joelle Vinciarelli, drummer Eric Lombaert and Christian Malfray, the live electronics guy – who come to us from three like-minded French metal bands, Nappe, Talweg, and Sun Stabbed, have gathered their forces and return with this bruiser, A Quiet-Earthquake Style (DOUBT 17) released on Doubtful Sounds, a label that’s home to such lunatic misfits as Ogrob, Astatine, Micro_Penis, and France Sauvage. Cover art printed in grisly red halftones may depict a volcano in full spate or the glowing ashes of a catastrophic forest fire (unless you buy the version with the blue postcard insert, in which case it’ll probably be a vision of a freezing abyss on Planet Jupiter). Either way you know mass destruction is on the agenda for today’s bowl of soup. Band come out fighting with the title track (subtitled ‘the heavens above’), a heavy-hitter which pounds opposition to a pulp with steel batons, still exhibiting that “blocked” energy which seems to characterise this style of playing, and this band in particular; thrash as they may, satisfaction eludes them. This seems to be the only time on the album when tub-man Lombaert has a chance to shine with his brutal percussive blows, so fans of conventional death metal may find this is the only track they can really clasp to their venomous bosom. Equally strong on the bad-tempered brooding emotional state is ‘Some Ghastly Fright’, which chugs along like a monotonous train ride into the lower depths…La Morte Young might be developing a method that blends all these loud guitar sounds into a fitful murk, suitable for inducing unpleasant hallucinations, which is further shot through with unearthly howls and distant wails. A strong constitution is required to endure this particular excursion into Hades, as the sulphurous gases thicken and our lungs collapse. Only ‘Heavens Cover The Abyss’, a tune subtitled ‘A Solenel Feeling’, offers relief from this infected vision, as the band create a slow and poignant mysterious twilight drone using high notes and trebly tones. Even here the sense of distress and alarm is never far from one’s elbow. The album ends on an even more unpredictable note, with ‘Memory Awake’ – where strange electronic sequences and strings dominate, and we might almost be hearing an avant-garde techno release from some undiscovered corner of Cologne or Berlin, were it not for the wholly alien guitar licks that swarm around us like so many flying vermin. I see now perusing their discography that I missed getting a copy of their 2015 split LP with Drone Electric Lust, which is just too bad. A great album though – it seems La Morte Young are finally hitting the bingo-tree with their hammers and scoring 18 out of a possible 20 on the avant-stoner-doom dartboard, and Stefan Neville of Pumice has provided words of praise for the press release. You’ll never settle for Sunn O))) again! From 23rd August 2018.